The free number management online control panel allows changes to be made to numbers instantly 24/7. The online control panel allows you to modify all your numbers with ease, as well as for viewing call statistic reports, all at a click of a button. 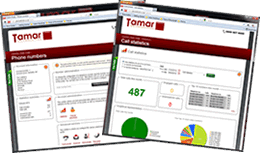 Existing customers can login to the Tamar Telecommunications online control panel here. There is also a mobile app version of the online control panel, allowing customers to manage their numbers on the go via their mobile phone. Further details can be found on our mobile app page. The online control panel gives you access to our range of free number services. Click on any of the below services for further information. The following chargeable services are also available via the online control panel. Click on any of the below services for further information. New products and services are being added to the online control panel on a regular basis. If you are looking for a particular telecom product or service which isn’t listed above, please call us on 0800 772 0000.